1350 litre Single Skin oil storage tanks are manufactured with a 2” fill point with cap and chain, a clock type tank contents gauge, 1” bottom outlet and 1/2" drain. 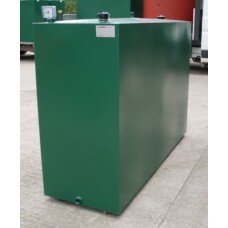 The tanks are undercoated in red oxide and top coated in a gloss green paint finish. For your convenience a tank a single lifting eye has been added to the top of the tank for easy positioning and a bottom outlet fitting kit is included which contains a 1" to 1/2" reducer, isolation valve, filter, 1/2" to 10mm connector, ptfe tape and heldite sealing compound.